Party Buses have become the entertainment center on wheels. These large buses feature extremely comfortable lounge seating with additional amenitues such as mood-lighting, climate-control, bars and more... all while featuring top-level Hi-Fi sound and video systems. We offer the following Large Party Buses for parties of up to 20 passengers. If you require travel for more than 20-people click here. Our 14-Passenger Party Bus offers all of the luxurious comforts and amenities of a limousine with far more features, seating and space. 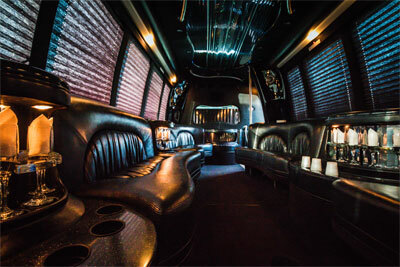 Ride in style while enjoying plush leather seating, full bars, a full entertainmen section from 2 flat panel TV's, full Hi-Fi stereo surround sound mood lighting and all of the tech access you'll need from plugging in your laptop or smartphone to having modetn safety equipment to help secure you and your party. AM, FM, CD, DVD, 2-Tv's-15"and 36"
Our 15-20 Passenger Party Bus takes it a step futher with more space and more ultra-luxury leather perimiter seating, larger flat-panel screens, more spekers thoughout and complete climate-control with a built-in powerful HVAC system. Our 15-20 passenger Party Bus is ideal for large partys who want to relax and enjoy the ride while our experienced chauffeurs do the driving. 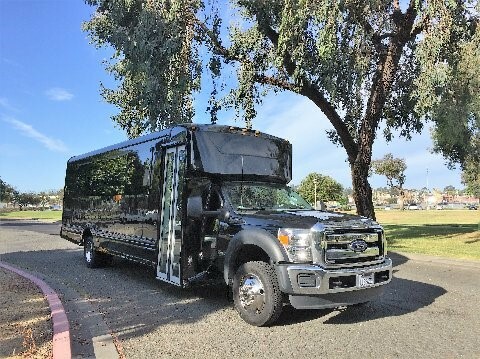 Whether you want to have fun for Prom or you want to relax on a Wine Tour of Sonoma or Napa Valley Wine Country, Million Services large-party Bus Rentals has you covered. Our Party Bus amenities include hi-fi video and audio systems, luggage area, restrooms, ultra-comfortable seating and much more. Enjoy our Chauffeured large-party Buses for weddings, proms, bachelor/bachelorette parties or just a night out on the town. Whether painting the town red or enjoying a little red wine on our Wine Tours of Napa Valley, Sonoma and the Wine Country, you’ll be traveling in style. Contact us today (using the convenient form below) for rental questions and pricing. See why we have a 5-Star rating on Yelp and scores of happy customers! 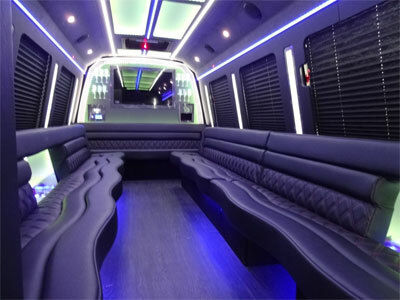 Party Bus: The large-party Bus Limo is a new concept in luxury travel; also referred to as Limo Bus, or large-party Van, Limousine Bus, or Luxury Bus. If you've been searching for a limo service and are overwhelmed by the number of companies out there, STOP wasting your time. You've found what you need. Reese was awesome from beginning to end. We talked a couple of weeks before my birthday event and got the mini party bus limo (which was amazing) reserved. Reese and I then worked back forth to figure out which Sonoma Wineries would be best for our trip. Come day of the event, Reese was there on time, the limo bus was incredible, and it was basically a non-stop party the whole time. I got several emails from my friends a few days later saying that it was easily one of the most fun days of the year so far. I will only be calling Reese and Million Services Limousine for future events!